This thesis examines the use of contemporary Internet memes within online activist spaces. Visual imagery shared on the 2011 Blue Out Facebook event page offers an opportunity to discover new implications for social justice-informed arts education. All content on the Facebook event page was examined to compare rates of interaction (“Likes,” “Shares,” and replies) of different posts types. The high proportion of interaction enjoyed by the Blue Out Internet memes, as compared to hyperlink and text, sheds light onto how these works functioned within the event’s online activist environment. Furthermore, this study uses visual discourse analysis (Rose, 2012) to examine the ideas portrayed by the Blue Out Internet memes. 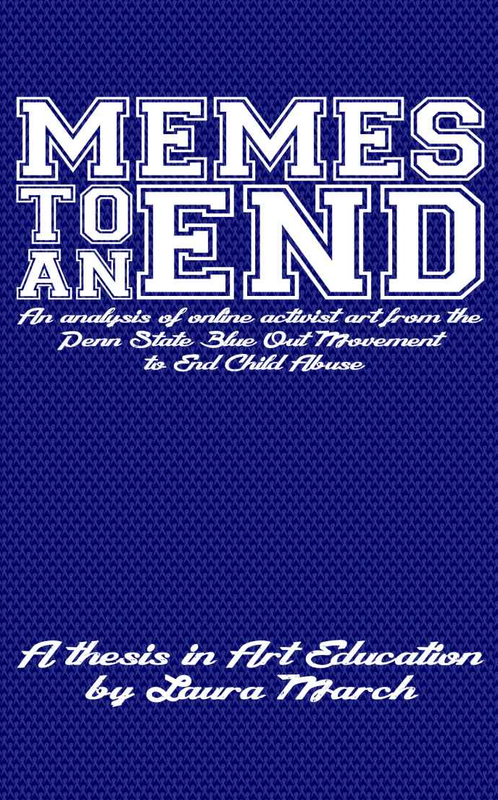 I made my Art Education thesis, Memes to an end: An analysis of online activist art from the Penn State Blue Out Movement to End Child Abuse, available in eBook form though Amazon.com. Please feel free to contact me to use the research for educational purposes or for any other information regarding the project.